The most powerful Atlantic storm in a decade has caused widespread destruction across the Caribbean and the southern US, leaving 55 people dead. Irma, at times a category five hurricane, packed winds of up to 295km/h (185mph). 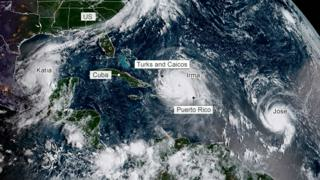 The storm cut a devastating trail across Caribbean countries and territories before moving up through the US states of Florida, Georgia and South Carolina, weakening into a tropical depression. An estimated 1.2 million people have been affected. At its peak, Irma was a category five storm with winds topping 295km/h (185mph). According to Phil Klotzbach, research scientist at Colorado State University's Department of Atmospheric Science, Irma's top wind speeds were tied with the second-strongest maximum winds of all time for an Atlantic hurricane. Irma matches a 1935 storm in the Florida Keys, Hurricane Gilbert in 1988 and Wilma in 2005. Only one hurricane, Allen in 1980, has recorded stronger winds, at 190 mph, he said. However, Irma broke Allen's record for sustained winds. It maintained maximum wind speeds of 295km/h for longer than any other Atlantic Hurricane. 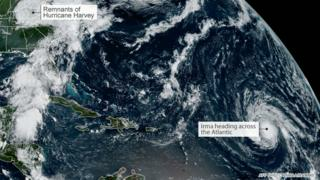 The remnants of Hurricane Harvey, which hit in late August, could still be seen by satellite when Irma made its way across the Atlantic towards the Caribbean. Irma was just a category two storm on 2 September, but soon became category three. Irma grew stronger quickly because of a combination of very warm water, high levels of mid-level relative humidity, and vertical wind conditions, meteorologists say. 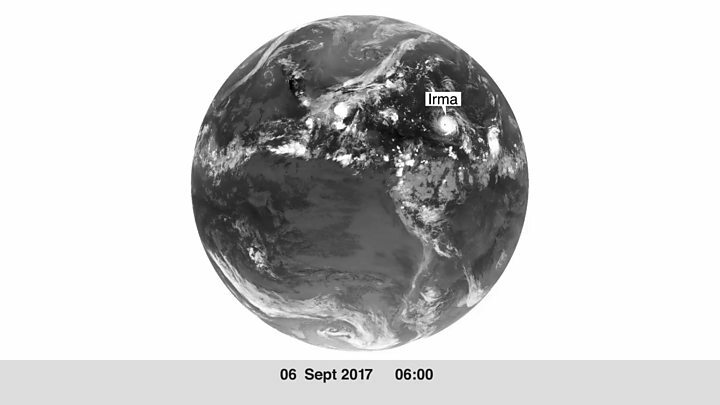 Between 2 and 5 September, Irma strengthened from a category three to a category five storm, the highest possible level. By 7 September, Irma was being followed by storm Jose, which was also upgraded to hurricane status. 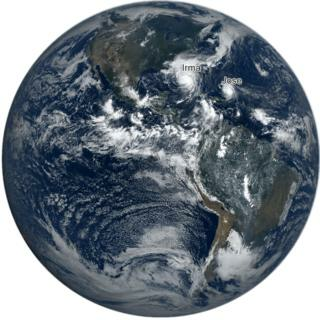 Also present was Storm Katia in the Gulf of Mexico, which became a hurricane before it hit the Mexican state of Veracruz. Two people died in a mudslide caused by the extreme weather. Infrared data from the Nasa-National Oceanic and Atmospheric Administration's Suomi NPP satellite on 7 September revealed very cold, very high, powerful thunderstorms stretching around Irma's northern, eastern and southern sides. Storms with cloud tops reaching very low temperatures have the capability to generate "very heavy rainfall", according to Nasa. 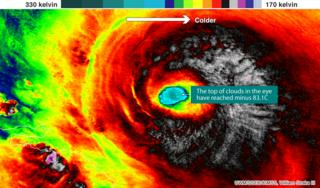 Cloud-top temperatures at the centre of the storm were as cold as 190 Kelvin (minus 83.1C/117.7F), Nasa said. 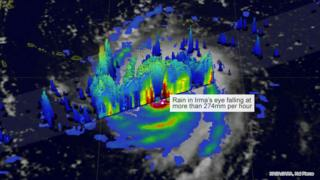 The eye of the storm measured about 35 miles across and generated "extreme rainfall". Nasa's rainfall analysis showed rain falling at a rate of more than 274mm (10.8in) per hour on 5 September in the solid ring of storms within Irma's eye. The powerful storms rotating around the eye were really tall, reaching altitudes greater than 12.5km (7.75 miles). But the tallest thunderstorms were found south west of Irma's eye, reaching heights of more than 16.2km (10 miles), Nasa said. Warm oceans, along with wind speed and direction, are the two key ingredients that fuel and sustain hurricanes. As Irma approached Florida, it passed over waters that are warmer than 30C (86F) - hot enough to sustain a category five storm, according to Nasa scientists. The green line on the map tracks Irma's path between 3 and 6 September. Hurricane Irma has hit many of the Caribbean's islands, and made landfall in Florida on Sunday. Huge volumes of water are pushed by hurricane-force winds. When they meet land, the water surges inshore at levels far exceeding normal tides. Storm surges were caused across the south of Florida.